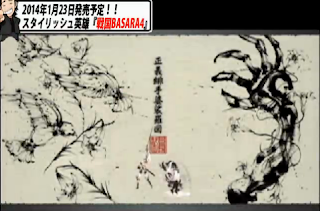 Today's Hagi-Toko broadcast on Nico Nico Live included some new Sengoku Basara 4 content as promised once again. This time, the guest was series producer Kobayashi 'KobaP' Hiroyuki and the beginning of the show went over all of the cool stuff that happened at yesterday's Shinagawa demo event including some too-short glimpses of Shikanosuke's gameplay demonstration. Then it was straight into the gameplay demonstration with the first of the 'returning' Sengoku Basara 2 characters, Nagamasa. The stage was Keiji's glitzy Kaga: Maeda Kabuki Matsuri festival and Nagamasa's battle comrade was, of course, Oichi. KobaP talked the hosts through Nagamasa's various moves and showed off his charge techniques. I'm looking forward to playing as him more than ever (and Oichi seemed to be having as much fun watching him in action as the audience was). The festival battle seemed excellent; both Toshiie and Matsu appeared and I'm very happy to see them getting proper appearances outside of their own boss stage. It also sounded as though Morita Masakazu (Keiji's seiyuu) was having a lot of fun with his lines. It was soon time to show off the pair's Giga Basara attack. 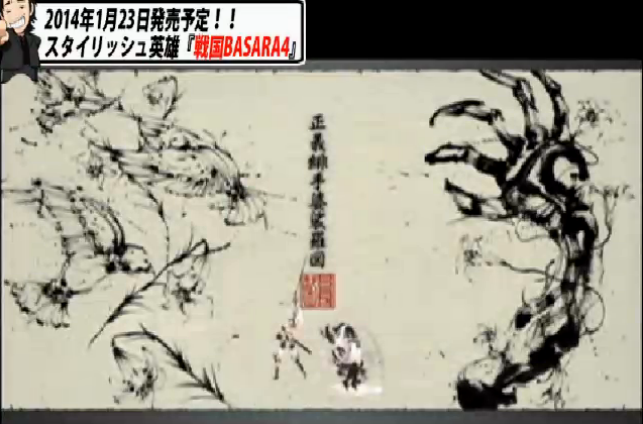 Oichi's Basara-e illustration is easy to understand; a demonic dark hand dotted with beautiful lilies. Her two-character title is 'Scarlet Hands'. Update: Even though I thought they were regular white Asiatic lilies, I now accept the suggestion of the commenter with better eyesight than me who thinks they're scarlet spider lilies - it fits Oichi better after all. Nagamasa's title is 'Justice' and the accompanying ink painting needs a little more interpretation; he was sometimes known as the 'Hawk of Oumi' but those birds look more like sparrows than hawks. This is a complete guess, but could they be a trio of hototogisu (Japanese lesser cuckoos) representing the extremely close connections that Nagamasa and his family ended up having with the three famous 'hototogisu' unifiers, Nobunaga, Hideyoshi and Ieyasu? I was happy to see that I wasn't the only person thinking along these lines on Twitter and forums. The birds seem to be carrying Nagamasa's usual white lilies too. Thankfully this is the last Hagi-Toko show of the year so the livestream schedule is going to be slightly less madcap for a few weeks - the next episodes will be on 20th and 23rd January 2014 with no word yet about which games they'll be covering. Surely they'll both mention Sengoku Basara 4 given the timing. In the meantime we have Weekly Famitsu coming out on Thursday (or earlier, if it leaks) with a website update and a Capcom Channel Sengoku Basara 4 livestream following later the same day. That stream will be a major one with the content available on both YouTube and Nico Nico Live simultaneously. I don't have the YouTube link yet, but you'll be able to access it through the Capcom Channel website when it's time to go live. There will be presentations at the weekend during the Jump Festa event too, so the news will keep pouring in almost daily. For those who missed the stream, people have uploaded half an hour of today's Hagi-Toko show onto Nico Nico Douga in two parts and Lacters suggested that I add a link to MasterOfBasara's YouTube channel which is collecting footage of the gameplay demonstrations all in one place. I know there are some people who can't sign up for a free Nico Nico Douga account so perhaps it will be a handy resource! I thought that those birds representing his daughters..
That would certainly be cute too. I really hope they explain the meaning behind the pictures in the book which comes with the special edition of the game, or I'm going to be curious forever! Btw, I'm new to twitter and I have a hard time finding kobaP's twitter page... any help would be appreciated! Whatever Nagamasa's art means, it surprisingly cute! Not what I expected. The little birds holding flowers make me think of peace and marriage symbols (usually a dove holding a flower or a ring) rather than war.